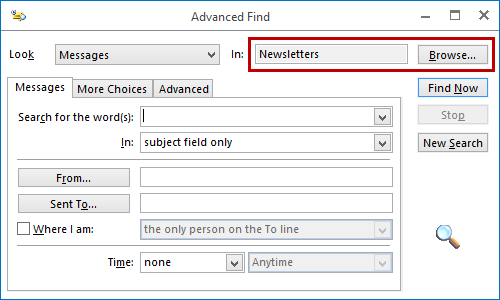 I frequently do a mailbox wide search in Outlook and luckily I also usually find what I’m looking for. Sometimes, it is also important to me to find out where exactly that email is located in Outlook. The search results list doesn’t tell me that but it is important to me that I know it is in the correct folder. Is there any way to determine the exact folder path of a message? Getting the name of the folder where a message is located in indeed not very obvious in Outlook. Determining the exact folder path is even harder and only possible via an even less obvious workaround or by using a macro. If only the name of the folder is important to you, you can determine this by opening the “classic” Properties dialog of a message via the keyboard shortcut ALT+ENTER. This works for an email that you have selected in the Search Results list but also for a message which you’ve opened via a double click. The old Properties dialog still holds some useful information. Another way to go would be to sort your Search Results by Folder. The folder name is then shown above the first result for that folder. You might need to scroll inside or expand the Arrangement box to see the Folder field. Extra tip: In Outlook 2013, 2016, 2019, and Office 365, you can also click on the “By Date” field that is shown directly under the Search box and right from the All/Unread or Focused/Other links and select to arrange by Folder instead. If you want to know the exact full folder path of a message, you can use a little trick via Advanced Find. Double click on the message to open it in its own window. The “Look in” field will reveal the folder name to you and clicking on the Browse… button will show you where in that is exactly in your folder hierarchy. Via Advanced Find, you can determine the exact folder path of an opened message. Unlike the Search results in Windows, you can’t right click on it and choose “Open file location” to take you to the exact location of the found file. If you want a similar functionality, you can use the “Get the path” VBA macro sample from fellow Outlook MVP Michael Bauer.